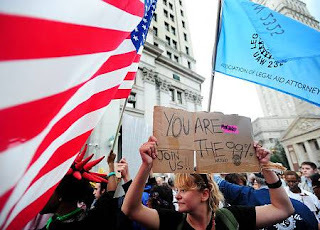 “What,” ask the pundits, “do the Occupy Wall Street people want?” When they deign to answer their own question, they tend, if they are uncharitable, to say that the protestors don’t know what they want, that any real message is lost in a miasma of different agendas. The more charitable type of pundit tends to say something more along the lines of “the protestors know what they’re against — economic inequality and the power of money — but they don’t know what they’re for.” I’ve spent enough time at the Chicago manifestation of the movement to see the iota of truth in both the charitable and the uncharitable analysis, but in the end both analyses miss the significance of what’s happening. To get at that significance, it’s important to drop the usual categories of analysis — left and right, cultural and economic, idealist and realist — and come at matters from an angle where things appear less familiar. Otherwise, we risk reducing something truly new into one or another version of what we find familiar. So bear with me while I propose a means of analysis that might seem quite strange: it’s the strangeness that we’re after, here, since the familiar categories of understanding have proved remarkably ineffective. Olympus is the realm of pure power, in its various manifestations. It is the dwelling-place of Zeus, the figure of pure executive power, and of Hercules, the figure of physical strength. It deals with realities, and does so by ruling over them, by authority, by influence and manipulation, or by sheer force. It is the realm of mastery. Hades also deals with realities, but does so differently. It is the realm of production, where Hephaestus works at his forge: his realities are those of existing materials, of the strengths and limits of bronze and silver and gold. Many people who know their myths have been puzzled about why Aphrodite is married to the lame, ugly, Hephaestus — but at a symbolic level, it makes perfect sense: while he is the figure of artisanal, or even industrial production, she is a figure of sexual reproduction. Together they cover the realms of inorganic and organic production. If Olympus is the realm of mastery, Hades is a subordinate realm, the world of labor set against the Olympian world of command. Parnassus deals less with existing realities than with the free play of speculation: it is the realm of Athena and the life of the mind, and of Apollo and the poetic. The muses dwell here, and it is to Parnassus that scholars and intellectuals repair. Like Olympus, it is a privileged realm, but unlike Olympus, it is not a world of power. To put it in modern terms, one might think of Olympus as the realm of executives, and Parnassus as the world of tenure, think tanks, and foundation grants. And then there’s Arcadia. This, too, is a realm of free play rather than of existing realities with all of their limitations. But unlike Parnassus, this isn’t a world of concepts or philosophies or epic poems: it’s a wild realm, a realm of potential energies. It’s the world of Pan, who dwells in forests and open meadows that have not been brought under cultivation. It’s the world of Diana the huntress, another forest-dweller defined in terms of potential: she is, after all, the virgin goddess. Everything about Arcadia is about the primitive state of things, from which other things might emerge. Hermes, the messenger god, is a special case: he inhabits the very center of the map, at the intersection of the axes: this is central to his function as the messenger god, and to his function as the god of boundaries and those who cross them. Once one grasps the general structure of mythological relations, a lot of things become clear about the significance of the myths: when Apollo and the faun Marysas (a figure of Arcadia) have a musical duel, won by Apollo who then flays Marysas, we have a kind of martyring of naïve or potential artistry by the established forces of Parnassus. One can see its relevance to, say, aristocratic culture’s disdain for folk culture, or the sophisticated formalist’s soul-crushing dismissal of emergent talent. But we’re a long way from talking about Occupy Wall Street. What happens when we try to view the movement through a conceptual framework as defamiliarizing as the Greek mythos? 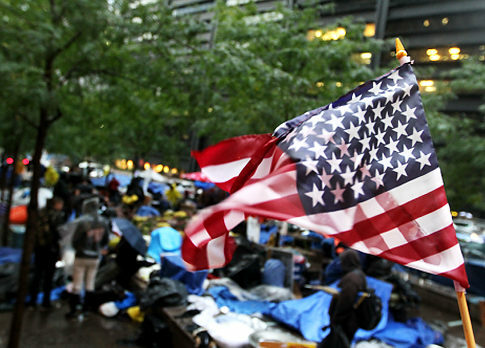 A stronger case can be made for Occupy Wall Street as a movement based in Hades, under the protection of Hephastus (if that sentence doesn’t defamiliarize the political categories, I don’t know what will). Unions, for example, have intermittently swelled the ranks of the protestors in New York, Chicago, and elsewhere. But the key word here is “intermittently”: the Occupy protests are not union-centered rallies, like those we saw in Wisconsin earlier this year. Union leaders don’t call the shots. If they did, we probably wouldn’t hear the punditocracy’s complaints about the lack of a clear message: instead, they’d be writing about how the demands of workers for decent wages and benefits are unreasonable in a globalized economy. What about Parnassus? Is this where the real center of the movement rests? There are certainly plenty of students to be found at the demonstrations, and a few professors (full disclosure: my tenured feet have occupied a few sidewalks and parks in Chicago). But the disproportionate representation of students is certainly a matter of greater opportunity to show up, rather than of significantly greater motive. As one man said at a recent demonstration, “you students, you’re my voice: I work 60 hours a week to keep my house, and I look after my kids, and I just can’t get out here often.” Some polls suggest that the majority of Americans support for the movement: this isn’t an ivory tower thing, not in its essence. Veterans, working stiffs, union guys, moms with kids in tow, office jockeys, street people, and others are all in evidence, and though they applaud when Cornell West speaks, they’re not lining up behind him: they’re standing beside him. This leaves us with Arcadia. But what exactly is Arcadia, anyway? In the Greek mythos, it’s all about what might-yet-be. It’s where Paris stands when he judges who has the greatest beauty: Hera, Athena, or Aphrodite. 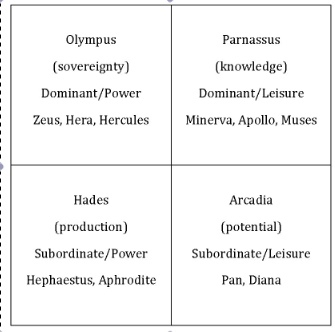 This is significant: he’s choosing between representatives of Olympus (power), Parnassus (knowledge) and Hades (production), and as he makes the choice from the only position outside of their realms: in Arcadia, the world of the not-yet, the potential. This, I think, is the proper location of the Occupy movement in the Greek mythos, at least at the moment. A few days ago I was arguing with the historian D.L. LeMahieu about the nature and meaning of the Occupy movement, and I’d begun with the proposition that what we were seeing was a resurgence of the now-old New Left paradigm: the language of class, anti-capitalism, and economic justice returning after a long eclipse. LeMahieu refuted all that, claiming that what we were seeing wasn’t a return to something old, but the birth of something new. Sure, there were old left-wing slogans. But this was part of the mulch out of which something very new was being born. We weren’t going to see a new socialism, because socialism was the countervailing force that tried to civilize 19th and early 20th century capitalism: it was a response to a kind of economics that doesn’t really exist anymore. We’re in a new phase of economic development, with transformative technological forces and the entry two billion of new workers into a global marketplace. We had an unprecedented economics (which developed out of our old economics), and it would create an unprecedented politics (which would also develop out of our old politics). I’m convinced LeMahieu was right: we’re not going to get a return to something old, even if the new thing we get takes up and transforms the old political paradigms. …. Remember that our basic message is “We are allowed to think about alternatives.” If the taboo is broken, we do not live in the best possible world. But there is a long road ahead. There are truly difficult questions that confront us. We know what we do not want. But what do we want? What social organization can replace capitalism? What type of new leaders do we want?….We are not Communists if Communism means a system which collapsed in 1990. Remember that today those Communists are the most efficient, ruthless Capitalists. In China today, we have Capitalism which is even more dynamic than your American Capitalism, but doesn’t need democracy. Which means when you criticize Capitalism, don’t allow yourself to be blackmailed that you are against democracy. The marriage between democracy and Capitalism is over. The change is possible. I’ve only felt the political ground shift beneath my feet twice in my life. The first time was in the aftermath of September 11, 2001, when one could feel a horrible lurch toward authoritarianism and fear. The other time is now. I don’t know where it’s all going any more than you do. But unlike last time, I have faith that it’s moving in the direction of hope. Archambeau, Robert. "So a Poet Walks into a Bar: The Poetry Reading as Rhetorical Situation." Association of Literary Scholars, Critics and Writers Conference. Boston University, Boston MA. 16 October 2011. Conference Presentation. So a poet walks into a bar to read his work to an audience. But what if it isn't a bar? What if it's a university auditorium, or a bookshop specializing in, say, works by women writers? What if it's a conference room at the A.W.P. 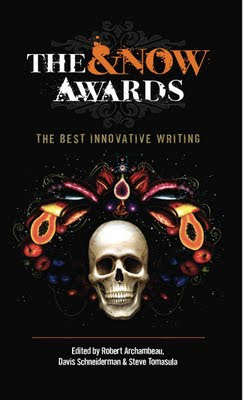 Convention, where the creative writing professors slap one another on the back and try to 'place' grad students and manuscripts with English departments and their journals? What if it's the 92nd Street Y, or a presidential inauguration, or a funeral? What if it's not a bar the poet walks into, but a recording studio, where he'll make a podcast or mp3 for an audience he's unlikely to meet? What if it isn't a poet who walks into a bar to read poetry to an audience, but a reader who walks into her study to read aloud to herself from a favorite poet's work? Venue matters, when poetry is read aloud: indeed, in few situations does Walter J. Ong's assertion that “a writer's audience is always a fiction,” seem less convincing than in a poetry reading, where the poets stand in the presence of the bodies of their listeners (9). Who speaks, where, to whom, and to what end? — answering these questions can tell us a great deal about the nature and meaning of performed poetry. One way to explore these questions is to adapt rhetorical theory—which has long been concerned with the specific relations of speaker, venue, and audience—to the study of poetry readings. There are obvious limits to such an approach. For example, it can tell us little of interest, perhaps nothing at all, about reading poetry aloud when one is alone, which may well be the most common form of spoken poetry. What is more, there are those who would argue that whatever situation a poetry reading creates, it is not in any meaningful sense a rhetorical situation. I'd disagree with this last criticism, but only because I'm willing to define what counts as a rhetorical situation marginally more broadly than does that most expansive of rhetorical theorists, Lloyd Bitzer. Bitzer, an emeritus professor of the University of Wisconsin, is generally regarded as one of the most respected rhetorical theorists of his generation, and is best known for introducing the notion of the "rhetorical situation" in an essay of that name in the inaugural issue of Philosophy and Rhetoric. For Bitzer, there are several components to a rhetorical situation. Firstly, and most importantly, there must be “an exigence” — a problem to be solved— “which strongly invites utterance” (5). Situations are rhetorical when the exigence, or problem calling out to be addressed, can be altered by the “bringing into existence a discourse of such a character that the audience, in thought and action, is so engaged that it becomes mediator of change” (4). The exigence, which may or may not be consciously perceived by the speaker and the audience, is “an imperfection marked by urgency” (6); while an audience, to truly be a rhetorical audience, must consist “of those persons who are capable of being influenced by the discourse” (8): the obdurate and the obtuse alike may be an audience, but stuck in their views, or incapable of growing through engaging with discourse, they aren’t an audience susceptible to change. As Bitzer puts it, the situation is rhetorical if "an actual or potential exigence… can be completely or partially removed if discourse, introduced into the situation, can so constrain human decision or action as to bring about the significant modification of the exigence" (6). In addition, a rhetorical situation contains two types of constraints. The first are those inherent in the pre-existing situation, such as the audience’s beliefs and attitudes, as well as pertinent pre-existing “documents, facts, traditions, images, interests” (8). The second type of constraints originate with the speaker: personal character, established style, and the like. (Those of you with a background in rhetoric will recognize these as Aristotle’s “inartistic proofs” and “artistic proofs”). So when a speaker enters a rhetorical situation, he or she enters a situation where some kind of change is wanted, a change that can conceivably be affected by discourse. The speaker faces people capable of being changed, if their beliefs and ideas, and the character and style of the speaker, come together in some perfect discursive storm. Of course rhetoric doesn’t take place under test-lab conditions of purity. Some rhetorical situations are simple, others much more complicated, even muddy. There may be multiple exigences in any situation, some incompatible, and an audience may consist of multiple constituencies, concerned with different exigences and with different constraints regarding the kind of discourse that will appeal to them. Bitzer allows fairly broad latitude when defining what sort of situations count as rhetorical. While his examples include political debates and Socrates’ “Apology,” he also includes situations where the simple need for information is rhetorical, if the providing of that information will have an effect in the world: the need for reporters to give details about the assassination of President Kennedy in order to calm a panicked population, for example, counts as a rhetorical situation for Bitzer, one that he seems to have struck him quite powerfully. The exigence, in this case, is a lack of information that could lead to panic; the audience is capable of receiving information and being calmed by it, if only because they are no longer bewildered. The speaker, knowing that he faces a worried population, and capable of projecting a certain gravitas in reporting the facts, will be successful in solving the exigence. As broad as Bitzer's definition of a rhetorical situation is, it doesn't extend to poetry: in fact, he specifically excludes poetry from his scheme, apparently out of a belief that poetry (as Auden so famously put it) "makes nothing happen." It's my contention that Bitzer is too modest about the scope of his own theory, and that poetry readings tend to have some sort of raison d'être, that they tend, in one way or another, to ameliorate some kind of situation. In fact, one way to understand the significance of poetry readings is to look for what sort of exigence a reading seeks to address, what imperfection in the world they seek to remedy through addressing an open-minded audience. So a poet walks into a bar. Let's say it's the Green Mill in Chicago, where (according the PBS documentary The United States of Poetry), "a strand of new poetry began… in 1987 when Marc Smith found a home for the poetry slam." 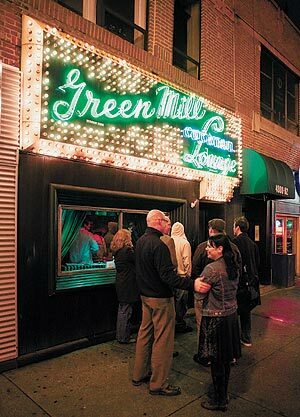 For Smith, there was certainly an exigence behind the slams, with their Dionysian audience participation, ad hoc systems of judging poetic value, liberally-flowing booze, and general informality. The exigence was the perceived dryness and audience-unfriendliness of more formal poetry readings, and a resulting alienation of poetry from potential enthusiasts. As Smith put it, the slam was to be an "up yours" to poorly attended, more effete poetry readings. Smith wanted to change the culture of poetry by holding these readings, "because no one was listening to the poets" (see Wiltz). 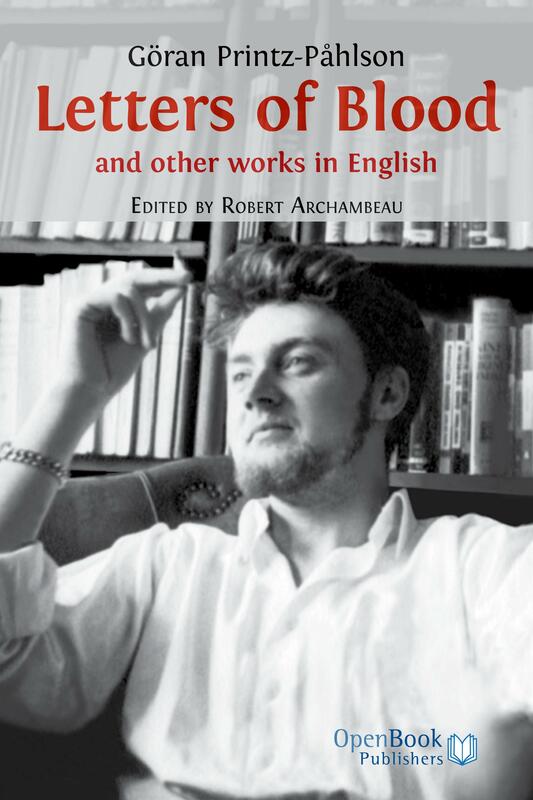 In the end, the exigence was the perceived removal of poetry from informal, non-academic contexts, and the resulting marginalization of poetry. Poetry may or may not make "nothing happen," but the poetry slam certainly attempted to make something happen. In addressing a perceived exigence, it created a rhetorical situation. The audience-based constraints (resistance to the idea of spending an evening sitting quietly in an uncomfortable chair listening to someone read) are addressed by physical comfort, alcohol, and a whole series of methods (foot stomping, hissing, woofing, and finger snapping are all encouraged, and have specific meanings) by which the audience is invited to participate in the performances as they happen, and in judging them when they're done. 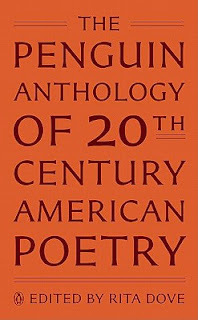 Certainly poets performing in these circumstances may face certain constraints of their own: in order to succeed they must not consider themselves or their work above spur-of-the-moment criticism, and they tend to need either a quick wit or the ability to emote convincingly in order to ameliorate the exigence. Poetry slams, of course, have evolved and changed, and can address many different exigences—my point here is simply to assert, contra Bitzer, that the poetry reading can indeed present a rhetorical situation. and committing." "All art is collective," he continued, "there is no such thing as art for art's sake" (Karenga). Larry Neal, another founder of the Black Arts Movement, echoed these sentiments when he proclaimed, in 1968, "the Black Arts Movement is radically opposed to any concept of the artist that alienates him from his community. Black Art is the aesthetic and spiritual sister of the Black Power concept" (28). The church-based conventions, which work with what Thomas calls "…the speaking voice that trespasses into song; and an antiphonal interaction with the congregation" (314) invoked cultural authority and stressed the link between performer and audience. So important did the specifics of the speaking voice of the Black Arts poet become that at least two poets of the movement, Sonia Sanchez and Johari Amini, came to see the written text of the poem as a performance score, akin to sheet music, with the printed poem indicating exactly how the poet wanted it to be read (see Kane, 85). From "come in" to "come on in" is a big step: the outsider becomes the insider, and the audience, at first sought desperately, is now welcomed warmly. It is a rhetorical performance of the creation of a specifically African-American community, and when Jones/Baraka read it, he showed that the poetry reading could indeed be a rhetorical situation. As Bitzer pointed out, rhetorical situations can be complex things, and may involve multiple exigences, and multiple audiences, in a single occasion. I'd like to end by gesturing toward one such complex rhetorical situation: the situation of the contemporary African-American poet in the most prominent form of contemporary poetry reading: the academically-sponsored poetry event. The exigences of university poetry readings vary considerably, of course; and I've been privy to more than one conversation in which it became clear that the sponsoring poet-academic and the visiting poet saw the main rationale for the reading in terms of personal career logrolling, a matter of "I'll help you put an item on your vita by hosting your reading if you help me in much the same way." But the more legitimate exigence of the university poetry reading, the reason generally given to the deans and chairs who hold the purse-strings, tends to be pedagogical. That is, the imperfection the reading seeks to ameliorate is some combination of a lack of student knowledge about poetry, and a lack of student sympathy for poetry, which the presence of a (charismatic, one hopes) poet will change. 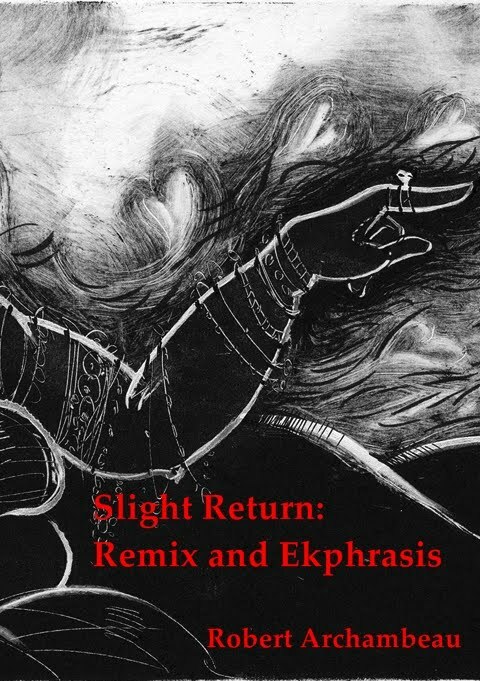 When an African-American poet walks into a university reading situation, though, we tend to enter one of Bitzer's complex rhetorical situations, with multiple exigences and multiple audiences. To some degree, the exigence is the same as in most university poetry readings: there's a need for the audience to learn about poetry-as-poetry. But the complex web of American social history, including one of the main legacies of the Black Arts movement — identity politics — means that there's another exigence, having to do with the politics of representation. As anyone who has ever tapped an academic cultural diversity fund as a means of bringing an African-American poet to a campus knows, universities tend to recognize two real or perceived exigences related to cultural diversity: the need to show African-American students that their community is represented in university cultural programming, and the need to expose non-African-American students to African-American culture, as part of the mission of spreading appreciation for cultural diversity. So an African-American poet walks into a university auditorium. He or she is there for a multiple exigence: to increase knowledge of, and sympathy for, poetry, and to represent African-American culture for African-American students, and to non-African American students. It's a kind of palimpsest, with a more moderate, pluralist version of the Black Arts exigence of cultural representation overlaid with the discipline-specific logic of the modern university, in which poetry readings are held for the advancement of knowledge of poetry. As we've seen with slam poetry and Black Arts poetry, the rhetorical situation of the poetry reading matters for how poetry is performed. Consider Harryette Mullen, whose success in both academic and identity politics-centered poetic contexts is rarely paralleled (she has won an award from the Black Arts Academy and taught in an ivy league university). Her work sends out signals to a number of communities, referencing the classical canon, the modernist and avant-garde forebears of contemporary experimental work, and iconic elements of African-American culture: Mullen has described her work as a textual confluence of Gertrude Stein, Sappho, and the blues, in which "Sappho meets the blues at the crossroads" (see Bedient 654). The work combines these influences in such a way that allows her, in performance, to emphasize any one of these elements in a single poem. This is accomplished largely through the polyvalent nature of her language. Once, after I spoke on Mullen's work, the African-American poet Tyrone Williams approached me to say that he'd attended a reading by Mullen in which the African-American audience, coming with their own expectations and interpretive norms (with, to use Bitzer's terms, different external constraints than I and my group brought when we heard the poem) received the poem as primarily about racial 'passing.' The fact that Mullen's work admits of such interpretations, and makes itself so readily available to different emphases in performance, gives an indication of one reason why Mullen's work has been so successful in the complex rhetorical situations where it is so often performed. Is singing "their songs" with "words your way" a matter of the contemporary, postmodern poet appropriating tradition (of Stein riffing on Sappho)? Or is it a matter of the African-American poet appropriating white or Eurocentric traditions (the blues meeting Stein and Sappho at the crossroads)? It's all in how the pronouns (which lack specific referents in the poem) are performed, how the poet chooses to perform them with the audience in the room. Contrast these lines to Leroi Jones/Amiri Baraka's "S.O.S.," and the importance of the rhetorical situation for the poetry and its performance becomes clear: Mullen, who habitually enters complex rhetorical situations with multiple audiences, is ambiguous and flexible, where Jones/Baraka, entering clearly defined rhetorical situations, is emphatic, community-oriented, and identity-group specific. I don't mean to suggest that I've done anything like perform a proper taxonomy of types of poetry readings here, nor do I want to claim I've covered all of the possibilities for slam poetry, Black Arts poetry, or the contemporary academic poetry reading (for poets African-American or otherwise). 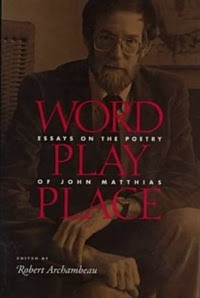 Rather, I've hoped to indicate, in what can only be a preliminary manner, that we will enrich our interpretations of the performance of poetry by understanding the rhetorical situation of those readings, and that we have much to gain by bringing the tradition of rhetorical theory to bear on poetic performance. Bedient, Calvin. "The Solo Mysterioso Blues." Callaloo 19.3 (Autumn 1996): 651-669. Bitzer, Lloyd. “The Rhetorical Situation.” Philosophy and Rhetoric 1.1 (January 1968): 1-14. Kane, Daniel. All Poets Welcome: The Lower East Side Poetry Scene in the 1960s. Los Angeles: University of California Press, 2003. Karenga, Ron. "On Black Art." Modern American Poetry, the University of Illinois. .
Neal, Larry. "The Black Arts Movement." The Drama Review. 12.4 (Summer 1968): 28-39). Ong, Walter J. “The Writer’s Audience is Always a Fiction.” PMLA 1975 90:1 (1975): 9-21. Pearcy, Kate. "A Poetics of Opposition? Race and the Avant-Garde." Paper read at the Conference on Contemporary Poetry: Poetry and the Public Sphere, Rutgers University: April 24-27, 1997. Reed, Daphne S. "LeRoi Jones: High Priest of the Black Arts Movement." Educational Theater Journal. 22.1 (March 1970): 53-59. Salaam, Kaluma ya. "Historical Overview of the Black Arts Movement." Modern American Poetry, University of Illinois. Thomas, Lorenzo. "Neon Griot: The Functional Role of Poetry Readings in the Black Arts Movement." In Close Listening: Poetry and the Performed Word, ed. Charles Bernstein. New York: Oxford University Press, 1998: 300-324. 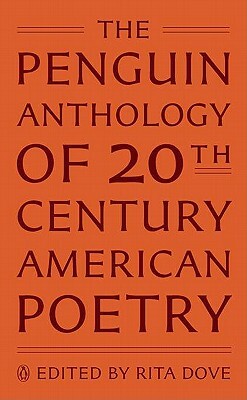 The United States of Poetry. Dir. Joshua Blum and Bob Holman. Washington Square Films/PBS, 1995. Wiltz, Teresa. "Slam Dunked: Poets Duke it Out in Chicago." The Washington Post (August 18, 1999): C1. The rest of the article is available here. So two American poets laureate, a Polish poet, and a Harvard professor walk into an emergency room. 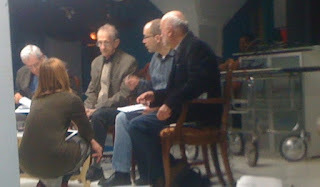 It sounds like the set-up for some kind of literary joke, but in actuality it was how things began last weekend when Philip Levine, Charles Simic, and Adam Zagajewski sat down for a discussion moderated by Steve Burt downstairs at Chicago's Chopin Theater (for reasons I never discovered, the downstairs part of the Chopin is called "The Emergency Room," and looks the part: painted bright white with teal accents, it features a harshly-lit stage with a gurney in the background). I wanted to make some joke about the gurney and the advanced age of the laureates, but would have had to tear Chicu Reddy, who was seated next to me, away from his discussion with Oren Izenberg and others from the University of Chicago English department, so I let it pass. The gathering was part of a two-day event called "After Miłosz," one of about 200 celebrations of the Miłosz centenary worldwide—Adam Zagajewski mentioned that this was the tenth such event at which he had spoken this year. There were three parts to the evening's events: readings of Miłosz's works by the participants, an open discussion among the panelists, and then a brief period in which Simic, Levine, and Zagajewski reading from their own works. Here's what I took note of in my battered Moleskine (direct quotes are approximate, from memory and quickly-taken notes—I regret any inaccuracies). One of the great achievements of Miłosz, said Simic, was to make us more conscious of the world around us, this being "the essence of the lyric poem," which comes to us trying to be disinterested, hoping (perhaps impossibly) to gaze at the world as it really is, making us see it again as if for the first time. This was not the Miłosz of The Captive Mind, the anti-communist writer welcomed by Americans during the Cold War. This was Miłosz as a someone both simpler and more profound than the writer of ideological works. Adam Zagajewski's recollections of how he first came to Miłosz soon complicated the emerging picture of the Miłosz the lyricist. Zagajewski read the first stanza of "Throughout Our Land," which he'd had been very hard to find when he was a student in Poland. He'd had to lie to a Dean about being a graduate student writing a thesis on Miłosz to be admitted to a special reading room where he was allowed to see the poem: whatever the lyrical qualities of the poems may have been, they didn't prevent the Polish authorities from seeing them as potentially ideological, and they were kept out of general circulation. Despite the allure inherent in all things forbidden, Zagajewski confessed to not having much liked Miłosz, at least initially. 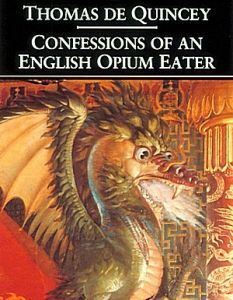 "There was an essay by Leszek Kolakowski, quite famous in Poland," said Zagajewski, "called 'The Priest and the Jester.'" In this essay, he went on to say, Kolakowski distinguishes between two different types of writer: the priest, who is a guardian of tradition and absolutes, and the jester, who doubts all things. "It was then not popular to be a priest in Poland," said Zagajewski. "We liked Zbigniew Herbert, who was a jester. I wanted to be a jester. Wisława Szymborska was a jester. To us, Miłosz seemed like a priest. But we were wrong." Instead of a priest, Miłosz was a poet in which the priest and the jester wrestled. There was a constant dialogue, sometimes a war, between the two, and this made for a rich and complex body of work. It also made Miłosz a more difficult poet to love than most others. “We love a poet for his voice,” said Zagajewski, “but Miłosz had two voices, always.” After a brief scuffle among the poets on stage about whether Miłosz had two voices, or one voice with different modes, or simply offered different points of view, things settled down. The room, I thought, had taken Zagajewski’s point. What once was great, now appeared small. Kingdoms were fading like snow-covered bronze. What once could smite, now smites no more. Celestial earths roll on and shine. As long, long ago, I launch my boats of bark. I’m not sure where Simic was going to go with this, because Zagajewski jumped in, sparks flying in his mind between “What Once Was Great” and the image of the Japanese cherry blossoms. “Once Miłosz chose exile,” said Zagajewski, “he became a Japanese poet, an arranger of cherry blossoms, because exile was so different from the environment in which he read his poems in Poland under the Nazis, and then under Stalin.” There was an underground poetry scene even under Hitler, he explained, and people gathered, at some risk, in private apartments to hear Miłosz read. His poems spoke to their condition as occupied and oppressed people, offering a truth not available in public places. “His poems helped people to live under Stalinism,” said Zagajewski, “they needed and adored him, and he liked it, because, like all poets, he was a little vain.” When he read in Poland there was an echo, a resonance of the poem with the needs of the broad public. “But in exile, that echo went away. Now in exile there was silence, and he became increasingly a self-deprecating craftsman.” Where he had written poems devoted to speaking truths that people needed to hear (“What Once Was Great” to be a poem in this mode), he became more a poet of beauty and spiritual yearning (I take “Encounter” to be closer to this sort of thing). I see what Zagajewski means. It’s common for people in oppressive situations to turn to poetry as a source for the articulation of values and needs that go unarticulated elsewhere. 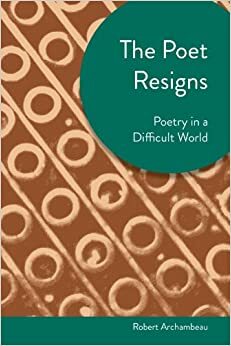 And in most contemporary Western societies, much of poetry’s marginality relative to other modes of expression has to do with our good fortune in having a great deal of freedom to express our views and needs through other means. A recent article in the satirical newspaper The Onion made some comic mileage out of the notion that Americans were turning to the works of one of the panel’s participants, Philip Levine, to see them through our current economic crisis: there was no similar opportunity for humor when Miłosz read in occupied Poland. And if Americans truly hungered for poetry en masse, would a reading in which a current laureate, a former laureate, and one of Europe’s most prominent poets, draw a crowd of about 75, the number present in the Chopin theater? Toward the end of the evening’s events, readings and discussions flowed into one another more-or-less seamlessly, and the readings of works by Simic, Levine, and Zagajewski turned into something of a discussion of the role of history and landscape for American poets. “History,” Levine remarked, “should only be read in a funeral home, next to a coffin, preferably the poet’s own,” since the nature of the material is so very often dire. But still, one ought not to write without a sense of history, he maintained. 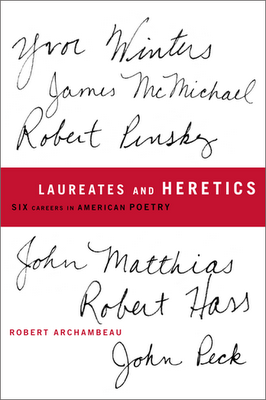 “I was just talking to Robert Hass and Jane Hirschfield, and they told me American poets have no sense of history. 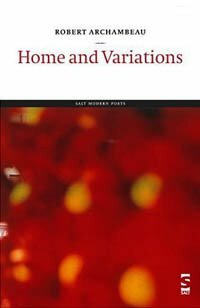 Well: Simic was born in Belgrade, my parents fled from Europe: we know history.” As, of course, did Miłosz—how could it be otherwise for him, the Polish twentieth century being what it was? As the things wound down, I noticed they’d run longer than I expected, and I was unable to stick around and see if I could drag Steve Burt or any of the poets a few blocks uptown to the tiny upstairs room at Myopic Books, where Larry Sawyer was hosting readings by Ann Shaw and Roger Reeves. I’m sure those reading went well, though: if there’s one thing the current American poetry scene makes clear, it’s that you don’t need huge crowds to have an excellent event.